The colour is all down to Edward's daughter Isabelle. When Edward ordered a new Mercedes Benz tractor unit in 2009 he decided to have it painted in Isabelle's favourite colour - pink! The colour has proved to be a big hit and now every vehicle has been painted pink to match. 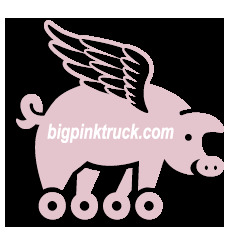 Our fleet of pink trucks certainly makes us stand out from the crowd and we have developed quite a following up and down the country!